A123 Systems, a developer and manufacturer of advanced Nanophosphate® lithium iron phosphate batteries and systems, today introduced Nanophosphate EXT™, a new lithium ion battery technology capable of operating at extreme temperatures without requiring thermal management. Nanophosphate EXT is designed to significantly reduce or eliminate the need for heating or cooling systems, which is expected to create sizeable new opportunities within the transportation and telecommunications markets, among others. "We believe Nanophosphate EXT is a game-changing breakthrough that overcomes one of the key limitations of lead acid, standard lithium ion and other advanced batteries. By delivering high power, energy and cycle life capabilities over a wider temperature range, we believe Nanophosphate EXT can reduce or even eliminate the need for costly thermal management systems, which we expect will dramatically enhance the business case for deploying A123's lithium ion battery solutions for a significant number of applications," said David Vieau, CEO of A123 Systems. "We continue to emphasize innovation with a commercial purpose, and we expect Nanophosphate EXT to strengthen our competitive position in existing target markets as well as create new opportunities for applications that previously were not possible to cost-effectively serve with lithium ion batteries." Unlike lead acid or other advanced battery technologies, Nanophosphate EXT is designed to maintain long cycle life at extreme high temperatures and deliver high power at extreme low temperatures. According to the testing performed to date at the Ohio State University's Center for Automotive Research (CAR) and the very low observed rate of aging, cells built with A123's Nanophosphate EXT are expected to be capable of retaining more than 90 percent of initial capacity after 2,000 full charge-discharge cycles at 45 degrees Celsius. CAR has also starting testing the cold temperature performance of Nanophosphate EXT, which A123 expects will deliver a 20 percent increase in power at temperatures as low as minus 30 degrees Celsius. "Based on our analysis, the performance of A123's new Nanophosphate EXT at high temperatures is unlike anything we've ever seen from lead acid, lithium ion or any other battery technology," said Dr. Yann Guezennec, senior fellow at CAR and professor of mechanical engineering at the Ohio State University. "Nanophosphate EXT maintains impressive cycle life even at extreme high temperatures without sacrificing storage or energy capabilities, especially as compared with the competitive leading lithium ion technology that we used on our head-to-head testing. If our testing also validates the low-temperature power capabilities that A123's data is showing, we believe Nanophosphate EXT could be a game-changing battery breakthrough for the electrification of transportation, including the emerging micro hybrid vehicle segment." Nanophosphate EXT is based on A123's proprietary lithium iron phosphate battery technology, which offers high power, long cycle life, increased usable energy and excellent safety as compared to other available battery technologies. Nanophosphate EXT is designed to extend these capabilities over a wider temperature range, enabling customers to deploy more advanced solutions that increase performance in applications that frequently experience battery cycling at extreme temperatures. Because Nanophosphate EXT is designed to reduce or eliminate the need for costly thermal management, it is expected to deliver these performance advantages while also increasing reliability, minimizing complexity and reducing total cost of ownership (TCO) over the life of the battery system for a number of applications, including those within the transportation and telecommunications industries. Transportation—Nanophosphate EXT is designed to augment the performance advantages of A123's solutions for electric and micro hybrid commercial and passenger vehicles. By enabling increased power at low temperatures, Nanophosphate EXT is expected to substantially improve the cold-cranking capabilities of A123's lithium ion 12V Engine Start battery. This would eliminate what has historically been the only performance advantage of lead acid in starter battery applications, and is expected to considerably increase the value proposition of A123's Engine Start battery as a lighter-weight, longer-lasting alternative to absorbent glass mat (AGM) and other lead acid batteries. This is expected to reduce TCO for micro hybrid applications, which represents a growing subset of the global electric vehicle market—According to Lux Research, the worldwide market for micro hybrids is projected to reach more than 39 million vehicles in 2017, creating a $6.9 billion market for energy storage devices. In addition, Nanophosphate EXT is expected to enable automakers to significantly reduce or completely eliminate active cooling systems in electric vehicle battery packs. A123 expects this to lower cost, reduce weight and improve reliability, providing automakers with a cost-effective solution that A123 believes will increases efficiency and minimize system complexity without sacrificing vehicle performance, battery life or driving range. Strategy consultancy Roland Berger forecasts that the global automotive lithium ion battery market will reach more than $9 billion by 2015. Telecommunications—Nanophosphate EXT supplements the advantages of A123's lithium ion battery solutions for telecommunications backup, which are designed to replace the lead acid batteries deployed at new and existing global cell tower sites built off-grid or in regions with unstable power. These sites typically require diesel generators to support the batteries, and due to the lengthy charge time necessary for lead acid batteries, the generators are often forced to operate for extended periods. In contrast, A123's solutions charge about six times more quickly than lead acid, which significantly reduces generator run time and lowers fuel costs by 30 percent or more. At cell towers in extreme temperature environments, Nanophosphate EXT further reduces operating and maintenance costs by minimizing or eliminating the need for air conditioning or heating. In higher-temperature climates, for example, the cost of installing and running the air conditioning necessary to properly cool the lead acid batteries can represent up to 50 percent of the total power consumed at each cell tower site. A123 believes that Nanophosphate EXT has the potential to significantly expand the global addressable market for its telecommunications backup solutions to more than $1.2 billion by 2016. "From the introduction of our breakthrough Nanophosphate battery chemistry to our envelope-pushing work developing ultra high power batteries for Formula One racing to our introduction of megawatt-scale grid energy storage systems, A123 has been at the forefront of battery and energy storage innovation. Today we announce another milestone, and believe Nanophosphate EXT to be a significant breakthrough," said Dr. Yet-Ming Chiang, co-founder of A123 and professor of materials science and engineering at MIT. "Lithium ion has always had a number of significant advantages over lead acid and other advanced battery technology, but its performance limitations at extreme high and extreme low temperatures have prevented it from addressing a number of important applications. Nanophosphate EXT changes this dynamic, and highlights why we believe continued lithium ion battery R&D is critical for discovering next-generation breakthroughs that can fundamentally change how the world uses energy storage." 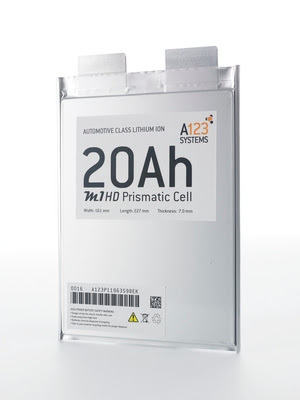 A123's Nanophosphate EXT technology is scheduled to enter volume production in A123's 20Ah prismatic cells during the first half of 2013. A123 is also evaluating plans to potentially offer Nanophosphate EXT across its complete portfolio of cell products.